The idyllic villages of East Dean & Friston are the gateway to The South Downs National Park, adjacent to Beachy Head, Birling Gap and the Seven Sisters. It is a fantastic location for walkers, cyclists and holidaymakers seeking a relaxed location set in beautiful countryside. The nearest beach is at Birling Gap, just one mile away, while Eastbourne town centre is just a couple of miles drive. Steeped in history, with strong Saxon and Norman influences, the flint church and cricket green, with its regular open-air market, offer quintessentially English treats. There is a great pub on the green which people visit from miles around – The Tiger Inn serves up tasty lunches and evening meals and you can enjoy your meal overlooking the green when the sun is shining. Or if you feel like something more exotic, there’s also the fabulous Thai Terre restaurant on the green. East Dean has a small selection of village shops, including a post office, hairdressers, grocery store, delicatessen and an award-winning butcher, as well as a doctor’s surgery. There is a weekly farmer’s market every Wednesday. For more details on this lovely village, visit the East Dean and Friston community website. This seven mile formation of cliffs and gaps is called “Seven Sisters” and now owned by the National Trust, interlaced with fine walking trails and the famous South Downs Way droving trail to Winchester over some 80 miles from Beachy head. Crowlink and the nearby Cuckmere valley was a centre for the smuggling trade from the Continent in the 1800s and a local war between the smugglers and the excise or customs men who built barracks at Cuckmere and Birling Gap to block and capture contraband landed at the four gaps in the sheer cliffs between Eastbourne and Seaford. Smuggling landed tea, tobacco, spirits, coffee, spices,and French fugitives. “Genuine Crowlink Gin” was a popular brand. The beaches at Crowlink Gap are still called Smugglers Bottom and the church at Friston was used to house the excise men. During the Second World war, a Spitfire squadron base was established on the downland to the West of Crowlink and today all that remains is a temporary hut that housed the Flight Sergeants’ mess. East Dean and Friston also make and excellent base for trips to Brighton which is an easy drive (around 30 minutes) or there is a direct bus between Eastbourne and Brighton with buses running as often as every 10 minutes. 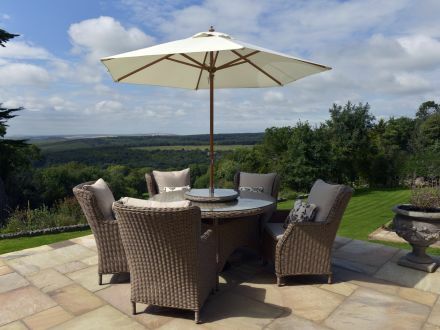 We can provide you with the finest places to stay in East Dean and Friston, including houses with swimming pools, private gardens and Little Friston Lodge, with some of the finest views you can experience in East Sussex. Let us know what you are looking for and we can provide our recommendations on Friston and East Dean accommodation or you can check availability and book online here. Do you already own accommodation in East Dean and Friston? Or perhaps thinking about buying a second-home in the area? We’d be delighted to have an informal discussion with you, either before you buy a property, with advice on locations or specific properties and on the best way to decorate and furnish it, or when you simply need help to let it.